Thermally Sealed for Particle Control. ThermaSeal™ 60 wipers are 100% continuous-filament, double-knit polyester fabric. These wipers are laser cut (thermally sealed) polyester, laundered in an ISO Class 4. Ideal for all purpose applications in critical cleanrooms and higher environments. 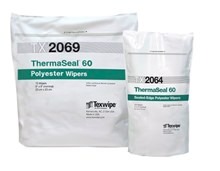 ThermaSeal™ 60 wipers offer good absorbency, wiping efficiency and abrasion resistance while maintaining chemical compatibility with standard solvents and alcohols.